We had a great time at Kakadu!! We had wanted to go to a Jumping Croc cruise on the way out (the Hunter Safari one) but we got away from town so late that we did not have time. We arrived at Jabiru with just enough time to unpack and get a BBQ dinner on before the mozzies came out and the sun set. We stayed at Lakeview which is owned by the local indigenous community instead of some multi-million dollar overseas consortium. I had been talking to a couple at Litchfield Café the week before and they had stayed there. They mentioned that the accommodation was in nice permanent safari style tents so I was not expecting anything anywhere near as flash as what they were. Tents, sure, but made out of a fine metal mesh with timber floors and high ceilings with a fan and fridge and sink. Really nice. I had wanted to take a nice photo but we trashed the place with our piles of pillows and blankets and bags and books and cooler bags within ten seconds. We were awake ridiculously early the next day. We had debated doing a 9am cruise but were not sure if we would be able to be ready in time. No problem. We were out of there super early and on the road. But we did not book the cruise and instead just turned up. Don’t do that! LOL! No room on the boat so we headed out to Ubirr instead. I had wanted to do sunset at Ubirr but because we were so late to the park we missed it. We already know we will need to come back to Kakadu so that is one thing that we will plan around next time. Sunset from the top of the rocks would be just magical! The whole area at Ubirr was great. 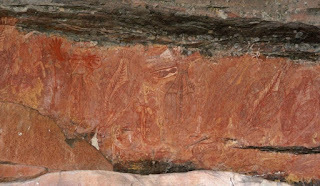 The rock art is just incredible to see. The community and history and culture that the aboriginals had is just staggering and so beautiful. If you were not already saddened by what was stolen from them in the past than seeing the artwork here I think would be a huge awakening. There is one section that we call the Menu Wall and it is a big area of rock that is painted with all the different food sources in the area. The animals are coloured according to fat deposits on their body, the cheeky mullet is painted with his neck broken or head removed as a way to remind the next generation that that particular fish needs to be killed as soon as he is caught (as opposed to leaving the fish until leaves to stay fresh for a couple of days) because the cheeky mullet is cheeky! And will wait until noone is around and then flip-flop back to the water. We were lucky enough to catch one of the free ranger talks and learnt a lot. We will certainly plan our next trip around the talk times at a few different places because it really adds a whole other dimension to the history and animal life in the area and the changes in the landscape with changing ocean levels and floods etc. 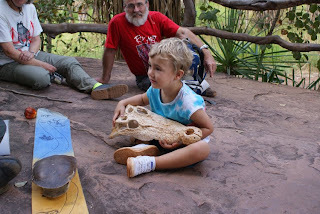 Jordy was rapt and listened to the ranger and wandered all over the rocks and at the end she spoke to Jordy about the crocodiles (one of Jordy’s favourite subjects) and so he chattered away. And then she bought out a big crocodile skull that was part of the information for her next talk at another section of art. Darcy was not so interested and just kept trying to run and throw himself off the ledge of rock perhaps hoping he could fly or maybe keen to see how big a thud he would make at the bottom…. After that we wandered past several other smaller art sites and climbed to the top of the rock escarpment. It was a bit of a climb and Jordy always insists on doing it himself (he enjoys the bushwalks that we do). Half way up he had a decent fall backwards into a crevice. A few tears and a hug and I asked him if he wanted me to carry him… he sniffed, took a breath, and say “No, I want to walk.“ and off he went back up the hill. Tough little nugget. I would love to see this area just after the wet season. The whole area floods and becomes a massive billabong and wetland. I’d like to see it half and half when there is more water than what we saw but not quite fully flooded (too fussy?!?!) but it was beautiful. The green grass just stretching out for miles. It would be nice at sunrise too with the birdlife around. A quick throw everyone in the car and off to the boat ramp. We had chosen to do the Guluyambi Cruise, another company owned by the local community, which offered more than performing crocodiles. I am so glad we did because we wanted the boys to see a croc up close but were not keen on them being lured to perform for food. 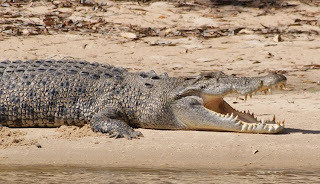 When the cruise first started our guide mentioned how the crocs were all mostly sleeping during the middle of the day and so I thought, bummer, we won’t get to see any… wrong!! Apparently come sunset you don’t want to be anywhere near the banks and I can see why if most of the crocs were off sleeping cos we certainly saw our fair share. The Guluyambi cruise went for just under 2hours and I lost count of the number of crocs we saw. We were also shown areas where it was (and is) safer for the local aboriginals to live by the river where the crocs can’t climb the rocks but where there was a good ledge and overhang for shelter and where yams and other bushfood grows. We saw more rock art and were told a few stories about Namarrgon, who brings the lightening. 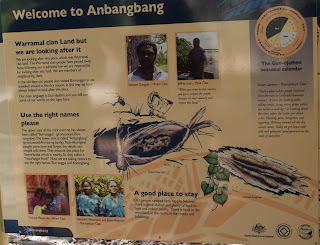 We got out at a section in Arnhem Land (we did not need separate permit because the company is owned by the indigenous community and so the cruise price covers the permit) that is near a spring that their stories say was created by the women’s digging stick. There was a great view up the length of the East Alligator river from the rock ledge. We also saw how the tropical monsoon rainforest that used to cover the banks has all been destroyed by the two cyclones that went though the area over recent years. From there we drove the 70 odd kms down to the Nourlangie Rock. Actually, we call it Nourlangie but that was a mistake that earlier white people made and it should be called Anbangbang… By this stage both the boys were asleep and we were really low on water. I stuck Darcy in the egro (sound asleep) and Jordy in the pram (also sound asleep) and we headed off to see how pram-friendly the path was. Not too bad really for the lower section but there was no chance of climbing up to the lookout (another stop for next time!). But we wandered around a few of the art sites which were different to those at Ubirr. There was one section that had a drawing of a family group and they painted the breast-feeding women with flecks on their breasts indicating the milk which i thought was rather cool. I called this photo Namarrgon but then i reaslised it's not... It's the other dude but i can't remember his name! 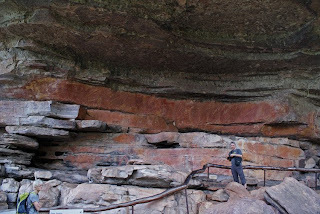 There is a lot more in the area to see including some impressive rock painting at Nawurlandja that we did not have time for (a much bigger walk to Nawurlandja that the kids were far too tired to attempt) but we would like to hear the ranger talks here too so another one to plan around next time. Back in the car all dying for a cold drink and off to Cooinda Lodge. I had wanted two nights at Lakeview but we booked so late that we could only get one night, so I ended up having to book the second night at Cooinda. Which actually worked out well as there are a good variety of things to do both north and south of the park and different areas that are worth seeing for sunrise/sunset that would be too far to travel too from just one place so next time we will stay two nights north and two nights south. But Cooinda was a heck of a lot more expensive than Lakeview. And I even got a local’s discount at Cooinda so without that the price would have been crazy. The room was nice, and they had a bistro, and pool (and cold water in the fridge!) but still, the full price would have been a bit over the top. There was a 90min ranger guided walk along Yellow River (right near the Cooinda Lodge) that we had intended to do but once we sat down we decided a beer sounded nicer than another walk so we went for a swim and then a relax at the bistro. Too late for the walk and too early for sunset but we headed down to Yellow River anyway. It’s a beautiful piece of river and if you’re into fishing it would be a fantastic place to throw a line in. The grass is all floating on about half a metre of water and there are lots of birds… and apparently the sun sets right over the water and is something to see. 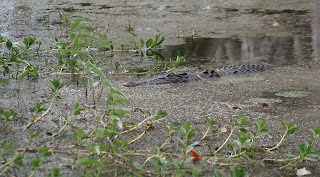 Instead we saw a crocodile hiding amongst the plants and inching closer, closer, closer to a tasty looking bird on the water’s edge. 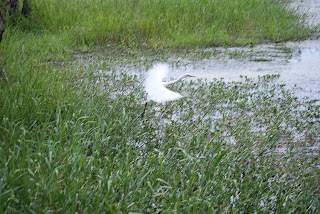 A small crowd gathered to watch and we all waited waited waited for him to get close enough to launch his attack but the bird was too smart and flew off before the croc was close enough. Here he is creeping creeping... and fly away bird! That evening the rangers did a slide show outside in the bistro that we caught most of over dinner before the kids decided it was bed time. A big day for two little boys. There was no phone reception out at Cooinda so I missed my only chance at Jabiru to make any calls. We had internet access though so I got a chance to update the blog and catch up on emails. We called into the Warradjan Cultural Centre on the way out the next morning- they have a great display on bush foods, and the moiety kin system and seasons and stories. That was really interesting and well worth a stop although perhaps best done when Darcy was not so full of energy and into everything and ready to destroy the place! Then a big four and a half hour drive back home via Pine Creek. 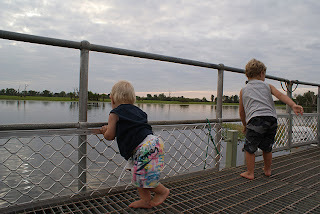 Having done our speedy glimpse at Kakadu we have a better idea about how to plan our next trip in. I think you could easily spend a week in the park. And the national parks camp areas look great too if you have a caravan. We found a great full day tour that we will do next time and a few other things. I am tempted to do a sunrise cruise along the Yellow River too but it’s rather pricey so I’ll have to wait and see. oh, and if you need fuel coming in or out... we did not fill up at Cooinda Lodge cos it was a little pricey, but it was even more expensive at the roadhouse on the way south and not much different at Pine Creek- so there you go! Thanks for the info we are in Jabiru arrived late yesterday.